July 4th is creeping up on us rather quickly, so we have jumped into Independence Day making mode with great gusto! Our designs for a handcrafted July 4th celebration will incorporate traditional reds, whites and blues, but we will do what we do to add a twist with each and every design so that you can make something truly unique for the big day. 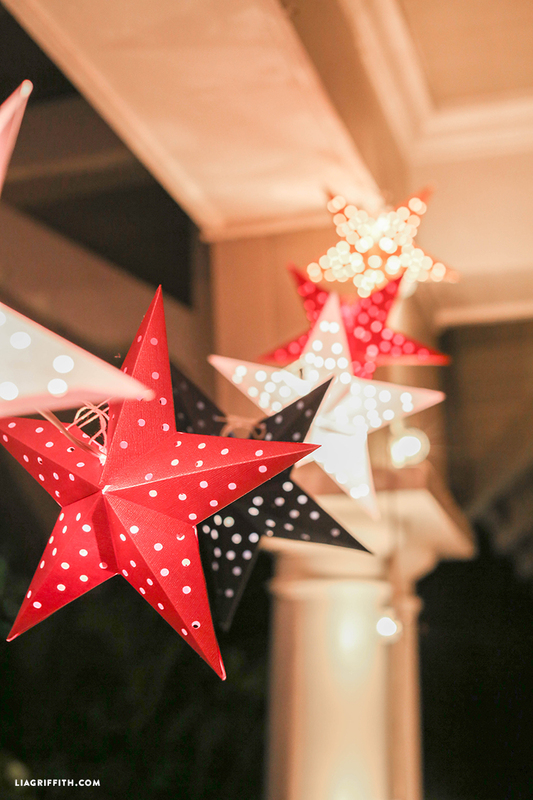 We have already shared our July 4th Party Invitations and continue the celebration theme today with these DIY paper lantern stars. I don’t think there is a household out there that doesn’t have a set of string lights packed up somewhere in their basement. 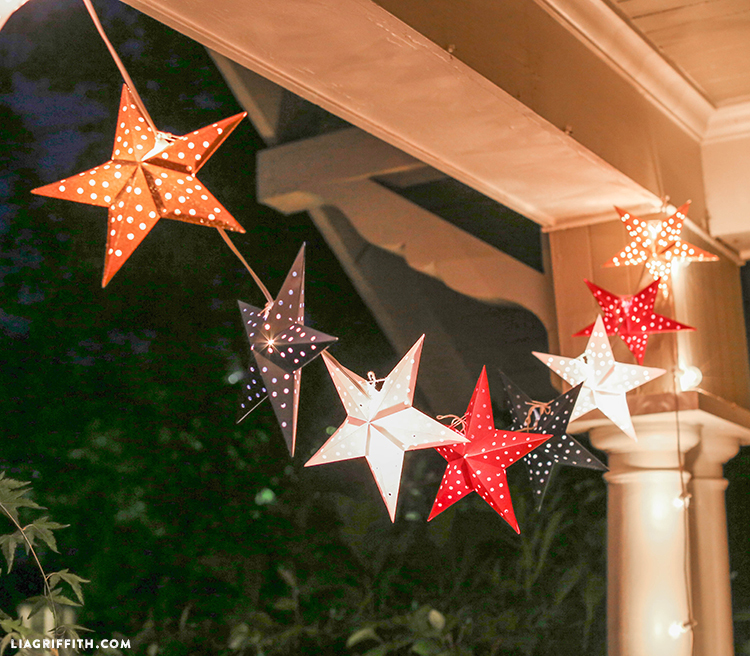 So pull them out, dust them off and make red, white and blue lantern stars for the 4th July – whether you are throwing a party or not! 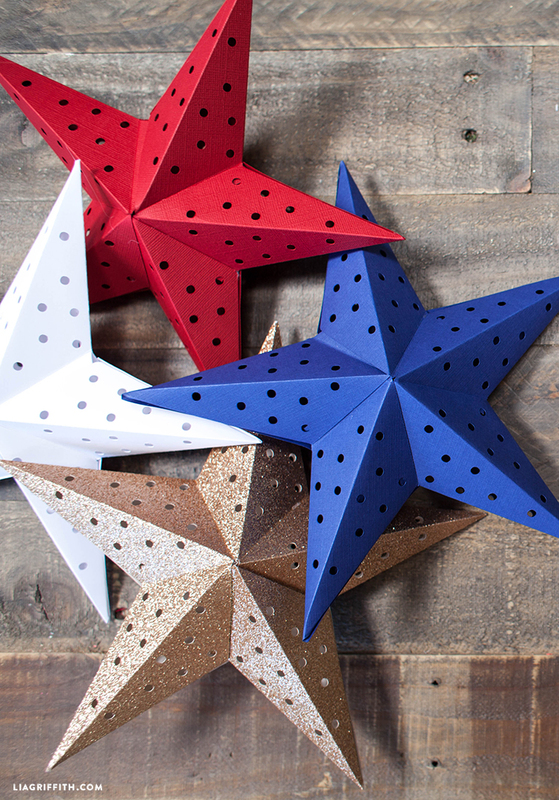 For our set of paper stars we used our Cricut cutting machine, which made it quick and easy to cut all of the pieces. If you are cutting by hand instead, we have also included the PDF template. You can simply add the holes with a small hole punch. We used card stock in red, white and blue, then added a shimmer of glittery gold to really liven things up. Once you have cut all your pieces it is just a matter of gluing the tabs together and fitting them over your string lights. Follow the step-by-step photo tutorial below to help you through this process! It’s really very simple but looks utterly divine, don’t you think? These look great! What paper type do you recommend for this project? Thanks! We used 12×12 cardstock that we found at Michaels. I’m having trouble with the download to Cricut for this project. The score lines are not lining up with the cut on design space. Got any tips for me? Hi Holly! Make sure you “attach” the graphics after you change the fold lines to score. That will keep it together! I made the stars using white card stock. 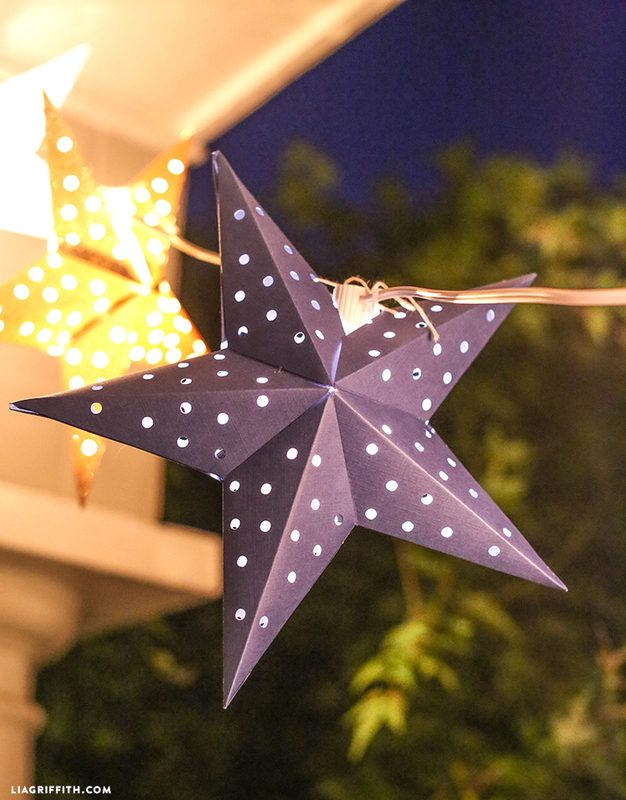 I glued 4 of the points together, then inserted the outdoor bulb into the star and then used scotch take to attach the 5th point. I added a little satin rose to the center of the star. They turned out very nice. I decorated the patio with the stars for the 4th of July to celebrate my daughter’s birthday, also on the 4th. I received a lot of nice comments. Thank you. I really loved them. Thank you so much for sharing your story with me! I am so glad to hear that this project worked out so well for your celebration 🙂 I hope your daughter had a wonderful birthday. If you have any photos of your garland feel free to send them to hello@liagriffith.com! Thank you for the instructions, I have been trying to make different types of paper stars, for Christmas window decorations. This one is very easy to construct and looks wonderful. You have to attach the scorelines and select them to be score lines in Design Space (click on the scissor icon and select score) If you have any problems the Cricut support team should be able to walk you through this. the star lights are very cute. what kind of string lights did you use? I didn’t see the bulbs in any of the pictures. If it’s there I might have to get new glasses! Thank you. I think I know exactly which lights you used. Wow!!! How wonderful – these would work for lots of occasions! Thank you, I really enjoyed these. So pretty at night!!! Thank you. I think they will look very festive for Christmas as well. Thank you, Lia. These are so pretty and a classy way to show our pride in America! Happy to hear that! Hope you have a lovely 4th of July!